The package of information came in the mail. It covered just one part of the Medicare plan choices: the Part D prescription drug coverage. It weighed two pounds. Health insurance decisions are weighty questions! Every year, you need to make those decisions. If you do nothing at all, you are choosing to continue with last year’s insurance, even if the premium or coverage has changed. What do you need to know to make a good decision? What are my routine health care needs? Are my health care providers in-network? This is the one of a series of articles on understanding health insurance. Click here for all of the articles. This series covers basics — exceptions and complications go beyond the basics. Everybody’s health is different. Start by looking at the past year for yourself and your family. How often did you (or your son, daughter, spouse) see a health care provider? Did anyone go to an emergency room or urgent care? Does anyone have a chronic condition, such as high blood pressure? Does anyone have allergies that need regular treatment? Does anyone in your family have ongoing treatment appointments: physical therapy, mental health, diabetes management, etc? Has anyone in the family had surgery, or been hospitalized, in the past three years? Do you anticipate any surgery or hospitalization during the year ahead? Answering these questions will give you a good idea of the kind of health coverage you will use in the year ahead. Many people have doctors or clinics that provide their regular health care. Make a list of the doctors, clinics, therapists, etc. that family members see for care. In a Health Maintenance Organization (HMO), you choose one HMO doctor as your primary care physician. That doctor would make referrals for any other service that you need. Referrals are limited to other HMO health care providers. Other insurance plans use a preferred provider organization model. That means you can go to any health care provider, with or without a referral. The insurance terms encourage you to choose only in-network providers. You will pay a much higher price for providers who are out-of-network. Each health insurance plan has its own network. Providers may be in many networks. You can check online or by phone to see whether your providers are in the network for a specific plan. The premium is the amount that you (or your employer) pay each month for health insurance. The deductible is the amount you pay for health care each year BEFORE your insurance company starts paying. After you pay the deductible amount, you pay a part of each bill as either a co-payment or co-insurance amount. Co-payment is a specific dollar amount that you pay for specific services. For example, your policy might say that you have a co-payment of $22 for each doctor’s office visit. Co-insurance is a percentage amount that you pay for health care services. For example, your policy might say that you pay 20 percent of the bill for each meeting with a psychologist. The out-of-pocket limit is the maximum amount that you have to pay for health care each year. The legal maximum for out-of-pocket limits is $6,450 for an individual and $12,900 for a family in 2015. Most insurance plans have lower limits. In general, a plan with lower premiums will have higher out-of-pocket costs. If you use a lot of health care services, higher co-payments and co-insurance can add up fast. If someone in the family visits the emergency room or is hospitalized, a high deductible can mean that you will pay a lot. If you earn less than 400 percent of the poverty level, you can get some help in paying premiums. For more details, see If you can’t afford health insurance: Three ways to get help. Prescription costs can add up quickly. 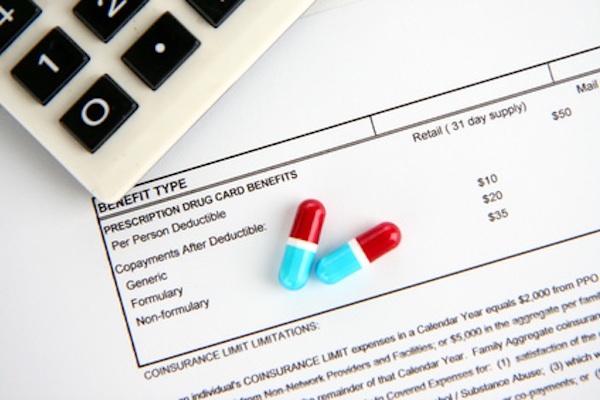 Insurance covers some of the cost, but the amount varies from one medication to another. Some medications are not covered at all. Each insurance company has its own tiers. Some may have two tiers of generic drugs. Insurance companies make changes in their formularies, so it’s important to check this every year. See Trouble ahead? Three health insurance alerts for more information. When it comes to insurance, nothing is simple. This series covers basics — exceptions and complications go beyond the basics. MNSure has “navigators” throughout the state to help with questions. You can find a navigator near you on the MNSure website. Open enrollment time: Should you renew or change your health insurance? Beyond the premium: What will you really pay for health care?